A big part of why chicken nuggets are so good is that they’re not complicated. They’re a decidedly no-fuss meal when you don’t feel like cooking something more intricate and they please people of all ages. They’re generally a worry-free food. 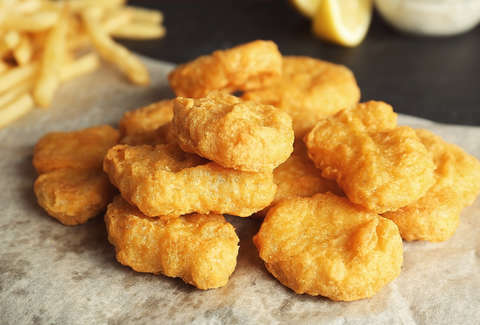 But now, thousands of nugs have been recalled for an unlikely -- and unpleasant -- reason. The US Department of Agriculture has been affected by the partial government shutdown, meaning many of its essential functions (including some food inspections) have been shuttered, but they continue to make some inspections a priority. High-risk foods, like soft cheeses, seafood, and meat and poultry products, are still being inspected during the shutdown. The Food and Drug Administration (FDA) resumed such inspections this week, and thank God they did. The last thing we need is a food-borne illness outbreak. If you think that a little wood in chicken nuggets is enough to inspire Trump to reopen the government, think again. In the meantime, maybe stay away from the nuggets.